KAISERSLAUTERN, Germany -- The responsibility of leading a sizable garrison encompassing 29 sites on 10,307 acres and more than 2,000 people would be daunting for anyone -- unless you are U.S. Army Garrison Rheinland-Pfalz Commander Col. Jason T. Edwards, who brings more than 22 years of experience and leadership to the garrison team and is up for the challenge. 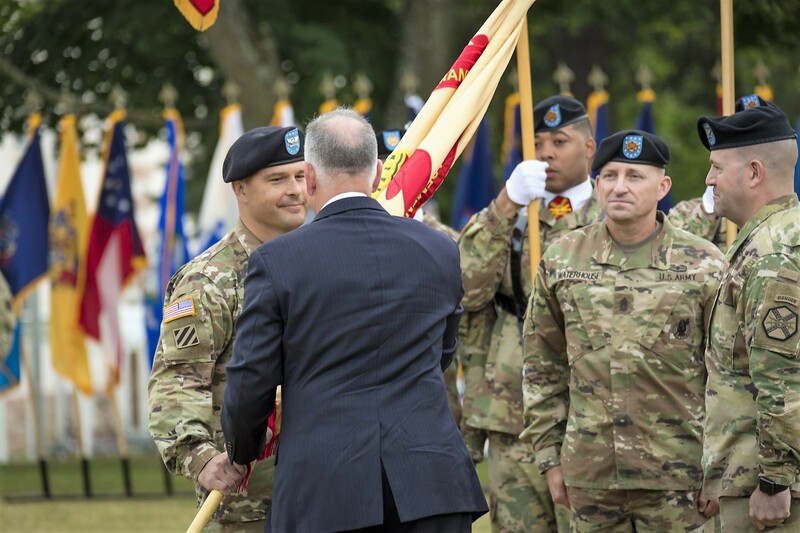 With two months on the job, Edwards is actively visiting all the installations within the garrison footprint to familiarize himself with its unique mission of delivering unmatched mobilization and installation support services to enable readiness for a globally-responsive Army. "I am obligated be physically present and seeing the sites I am responsible for. My calendar is structured to most efficiently do that," he said. In the spirit of becoming better acquainted with the garrison, the commander had breakfast with Baumholder educators, Aug. 24. "Is it important enough to get up early, spend two hours on the road and break bread with our teachers? Absolutely," said the father of two school-age kids. "Children are our future, and I'm speaking to the people who are educating our future. I'm doing everything I can to maximize my physical presence on our installations." And so far, after visiting nearly all the sites, the commander said he's impressed with the "amazing collection of Army professionals" serving the garrison. "We have pockets of excellence everywhere in this command, and I'm blown away by the history of the people that work here. It's so important for me to listen to their stories," he said. "We have some real heroes in these ranks, but sometimes we get so focused on the job that we don't realize what amazing human beings we have here. Our garrison has some living legends, but you'd never know it unless you get to know them." 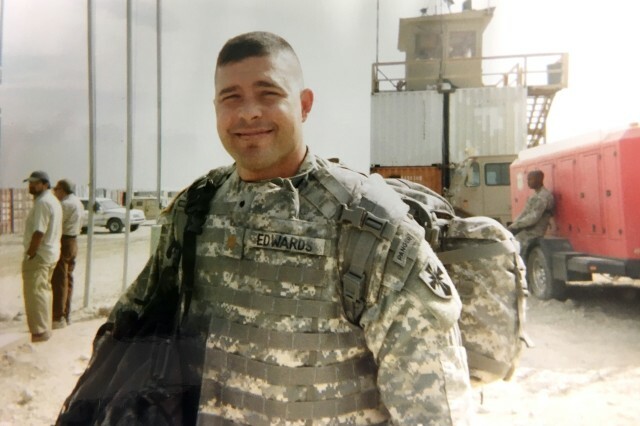 Edwards served in several joint contingency operations in Kosovo, Japan, Iraq and Afghanistan over the years, which helped him prepare for the challenge of caring for a sizable garrison in the Rheinland-Pfalz region. Throughout his career, he's served during national and international events that happened around the globe, worked in requisition and readiness and even went to Harvard to study for a year recently. The trick, the commander said, is the never-ending quest for self-improvement -- and not getting comfortable or complacent. "The biggest danger that people have is getting complacent. People can get more confident in their jobs every day, but should never get comfortable. The day you get comfortable is the day things start going wrong," he advised. 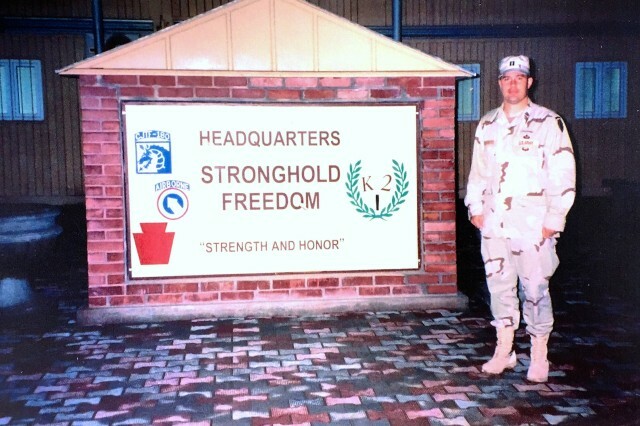 The commander learned about leading and participating in teams throughout his upbringing in Coldwater, Mich., while competing in football, baseball and wrestling. The year-round practices and drills taught him discipline and endurance that he would unknowingly use in his future career. The colonel was no stranger to the Army -- his father, Sgt. Thomas J. Edwards, was a door gunner with the 134th Aviation Company in Vietnam in the late 1960s. Although he grew up listening to all the thrilling stories and seeing images of his dad's wartime service, Edwards didn't feel compelled to serve in the military until he checked out the ROTC program at Central Michigan University -- that's where he found his calling. While attending an ROTC basic camp, "within days of being there, I knew that this is what I wanted to do -- no question. The rigor and discipline was in my wheelhouse," he recalled. 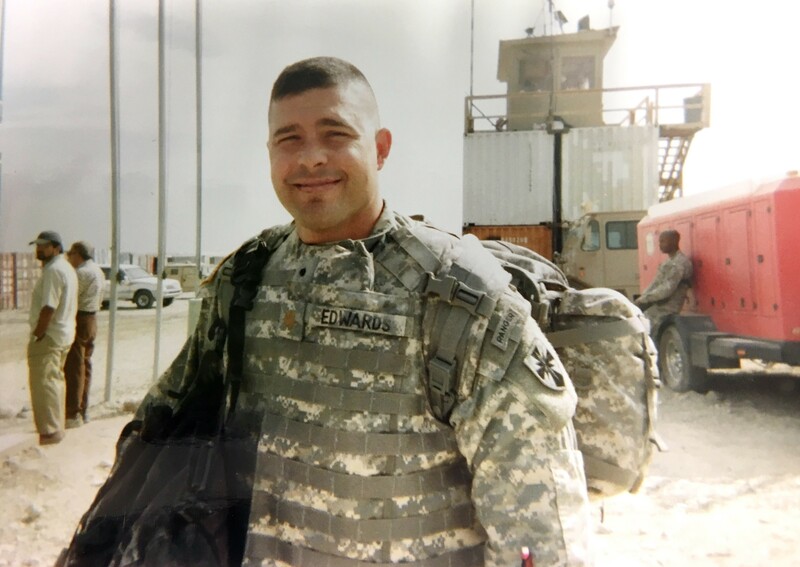 After completing the camp, Edwards traded his wrestling scholarship for a full-ride ROTC scholarship and two years later, pinned on second lieutenant bars in 1996. 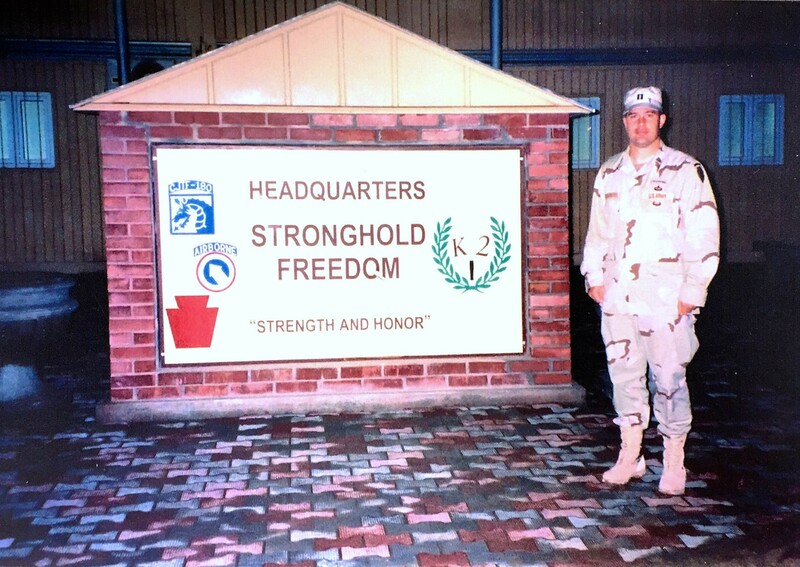 As his career progressed, the commander had several mentors who stepped forward throughout the seasons of his life from his parents and coaches to military friends and colleagues to guide and counsel over the years. "I have dozens of mentors," he said. "I've been blessed and had personal relationships with a lot of people, and fortunately, they pick up the phone when I call and listen to me -- even after they retire," he said. "Now, I am clearly in the point in my career when I need to answer the phone when people call me -- I need to be a mentor for others." As a mentor and leader, Edwards listens a great deal -- a skill he acquired along the way, because "when you are under massive time constraints and resource limitations, you need to put your phone down, stop looking at the computer and listen to people. To me, listening means connecting. If we are having a meeting, you will have my undivided attention. I owe you that. If we are talking, I'm going to listen and understand what your needs are." On top of that, action in a timely manner is important to the commander as well. He strives to understand whatever information is presented and, in the right time horizon, action the material. It's also important for him to be physically present, empathetic and genuinely care about people. "In this business, we talk about infrastructure -- improving buildings -- that's all good, and you need to understand those processes, but this business is about people," he explained. "Some of the greatest moments are when people are getting the things they need. To me, that's the best feeling. The only reason I'm in the military is so I can make it better for those who will be coming in next." As the fourth commander since the garrison was activated Oct. 1, 2013, Edwards is defining what it means to be the commander of a large garrison and making strides to learn its processes, fix its issues and keep it moving in a positive direction. "There is an awful lot of good things happening in the garrison, and I need to make sure the community knows that, because we have a responsibility to communicate the good and fix the things we need to improve on. If we are not doing something well, then I see it as an opportunity to excel. We'll figure it out. I know we have the leadership and the talent to solve these problems," he said. Lastly, the commander said he's very blessed to be here and wants to make a difference in the Rheinland-Pfalz. "This is where I wanted to come and be a garrison commander. I wanted to take everything I've learned over 22 years in the Army and apply that to a community. I'm exactly where I want to be," he concluded.